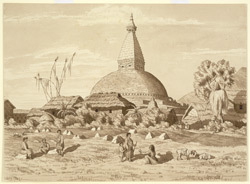 Drawing of the Bodnath temple at Kathmandu in Nepal by Henry Ambrose Oldfield (1822-1871), dated March 1854. The image is inscribed on the reverse: 'Buddhist Temple, called 'Kasha chait' or Temple of Kasha, at Buddhnath. March 1854'. Dr Oldfield, who was Residency Surgeon at Kathmandu from 1850-1863, wrote of the temple in 'Sketches from Nipal, Historical and Descriptive...' (1880), "It is situated about three miles to the east of Kathmandu, and from its great bulk and the height of its glittering spire, it can be seen from all parts of the Valley...It is believed to have been built over the tomb, and probably to contain within its garbh some of the ashes or other relics of an eminent Thibetan Lama named Kasha, who, having come to Nipal on a pilgrimage from Lhassa, died, and was either burnt or interred at this spot...The temple stands upon a square and very massive basement which is composed of three broad terraces, rising one above another. From the uppermost of these terraces the hemisphere springs; round its base is a narrow stone plinth, in which are a series of small niches or recesses which extend all round it. In each recess is a stone relief of the third Divine Buddha, Amitabha, the figures being all alike...The square toran is built of brick, and has the eyes of Buddha painted on each of its four sides. the spire is in the shape of a four-sided pyramid, the thirteen divisions of which are covered with plates of copper-gilt. It is surmounted by a large gilt chattra or canopy, from the upper surface of which rises the usual bell-shaped ornamental pinnacle."